SOME EVENTS WERE MEANT TO BE MINIMAL FOOTNOTES IN HISTORY, BUT CIRCUMSTANCES OVERTAKE THEM! The First Congressional Medals of Honor were awarded during the American Civil War to the survivors of such an inconsequential event. However, because of a book written by one of them and the need for hero's in the North. The "Andrews Raid", would forever be known as "The Great Locomotive Chase". This article is a look at the actual raid and how Hollywood portrayed it in 1926 and thirty years later in 1956. Above the original Army Medal of Honor first given in 1862. The raid was approved bt Brigadier General Ormsby MacKnight Mitchel. Mitchel had an interesting pre-Civil War career. As a young man he wanted a telescope and this desire would lead in 1845 to Ormsby Mitchel designing and building the second largest refracting telescope in the World at that time. Later he became the astronomer for the Dudley Observatory, in Albany, New York. He helped to establish observatories for the United States Navy and Harvard University. His observations in 1846 of the planet Mars led to an area in the South Polar regions being named "The Mountains of Mitchel". After entering the Union Army as a Brigadier General of Volunteers. He initially organized the northern defenses of Kentucky around Cincinnati, Ohio. From September to November 1861 Mitchel was given temporary overall command of the Department of Ohio. In December 1861 he took command of a division of the Army of the Ohio. The raid would be under the command of James J. Andrews. Andrews was born in Holiday's Cove, Virginia which is today's Weirton, West Virginia. He moved to Kentucky were he worked both as a house painter and singing coach until the Civil War broke out. Initially he became a smuggler purchasing contraband merchandise and bringing goods through the enemy lines to the North. Sometimes in reverse to keep up his persona as a loyal Southerner. Before the raid James J. Andrews became engaged to Elizabeth Layton of Flemingsburg, Kentucky. The Train Conductor that pursued Andrews was William Allen Fuller. Fuller was born at Morrow Station, in rural Henry County, Georgia. At the age of 19 he started to work for the Western and Atlantic Railroad and at the start of the Civil War in 1861. William Fuller became a conductor on the train lines running from and to Atlanta and was made a Captain in the Confederate Army. Andrew's Raiders took control of "The General", below, at a breakfast stop. While Fuller with the help of "Yard Foreman" Anthony Murphy, picture insert, followed on "The Texas". Which although most associated with the raid was the third locomotive he used. The "Andrews Raid" was not the first plan to sabotage the "Tennessee Rail Line" of the "Western and Atlantic Railroad". Which ran from Chattanooga, Tennessee south to Atlanta, Georgia. The line had been approved by the Georgia Assembly in 1836 and completed in 1842. At the beginning of March 1862 James J. Andrews proposed a plan to Major General Don Carlos Buell to take eight men, steal a train and disrupt the Confederate telegraph lines in western Tennessee. Along with burning the bridge over the Tennessee River at Bridgeport. His men were ready to leave, but the train engineer failed to show up and the plan was dropped. Above Major General Don Carlos Buell. The following month Brigadier General Mitchel had made plans for an all out attack on the Confederate stronghold at Chattanooga, Tennessee. Andrews proposed a new version of his March plan. He would take some volunteers south into Georgia. There they would steal a train and head north. Destroying telegraphy lines and railroad construction along the way and finally joining up with Mitchel. The raid was approved and was made up of the first Union Troops to enter the state of Georgia during the Civil War. As his second in command Andrews brought along another civilian who worked with the Union Army. William Hunter Campbell had been visiting friends in the 2nd Ohio Infantry in Kentucky. When Andrews asked him to join the raid. Initially "The Andrews Raid" would be made by Twenty-four men. Twenty-two of them where Union soldiers aware that if caught by the Confederate Army. They would be put on trial as spies and executed, because they all wore civilian clothing. The group left on April 7, 1862. The plan was to travel separately, or in two's to Marietta, Georgia. The first stop after the train left the heavy fortified Confederate city of Atlanta. In Marietta the raiders would board the train separately and without recognition of the others. James J. Andrews had advised his men that if they were stopped by Confederate troops to tell them they were on their way to enlist. As a result of that instruction prior to reaching Marietta. Corporal Samuel Llewellyn of the 33rd Ohio enlisted in the Confederate army, was able later to return to his own unit and promoted to Sergeant. He never recieved the Medal of Honor for the raid. While Private James Smith, actually born Ovid Wellford Smith, of the 2nd Ohio would also enlist in the Confederate Army. However, at first he was held prisoner in a local jail for possibly being a Northern spy. Smith also would get back to his unit and be promoted to Corporal. Unlike Llewellyn he did receive the Medal of Honor on July 6, 1864. 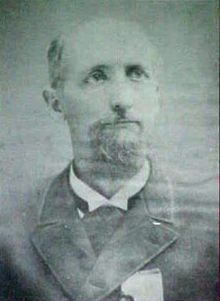 In Big Shanty, Georgia, now Kennesaw, Corporal Martin Jones Hawkins of the 33rd Ohio overslept, did not participate in the raid, was captured by Confederate troops and escaped back to his own lines. Later he would be promoted to Sergeant. He received the Medal of Honor on September 17, 1863. The same set of circumstances happened with Private John Reed Porter. Porter would become the last living raider until his death in 1923. He was awarded the Medal of Honor on September 17, 1863. On the morning of April 12, 1862. The locomotive "The General" stopped at Big Shanty to permit the passengers and crew to have breakfast and have more fuel placed in the Tender. At this time there were no such things as dinning cars and everyone left the train to eat. As this was occurring James J. Andrews and his now 19 men decoupled all but three box cars from behind the tender. Observing the locomotive and box cars pulling away from the station. Conductor William Allen Fuller and Yard Foreman Anthony Murphy reacted immediately. They stopped eating their breakfasts, ran out after the departing "General" and told someone to alert the authorities. Which actually was a problem as Andrews had chosen Big Shanty, because there was no telegraph at the stop. The two men took the only available means of transportation, a Handcar, and started what would become "The Great Locomotive Chase". Above a typical Handcar of the period. Chasing a locomotive in a Handcar may seem totally impossible, but my reader must understand the conditions in 1862. To begin with the top speed of a locomotive, completely detached from a train, was 15 mph with 20 mph tops on perfect conditions. The line between Big Shanty and Chattanooga was anything but perfect conditions. Even today's modern locomotives only have a top speed of 40 mph on the same line. The terrain is very hilly and the steepest grades are extremely high slowing down any locomotive. Let alone one being used by James J. Andrews that was stopping to cut telegraph lines and destroy track. 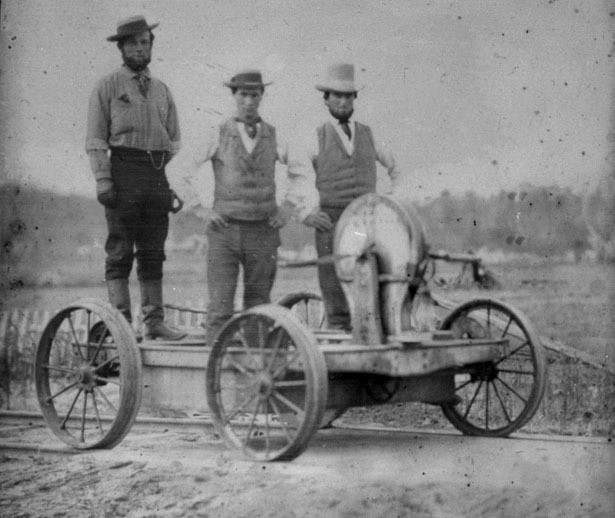 The distance William Fuller, Antony Murphy and one Section Hand traveled in their Handcar pursuit was approximately 19 miles. They arrived at Etowah Station which is now Canton, Georgia. It was at Etowah that Andrews made his second mistake, his first I will mention shortly, by not believing that anyone was pursuing him. 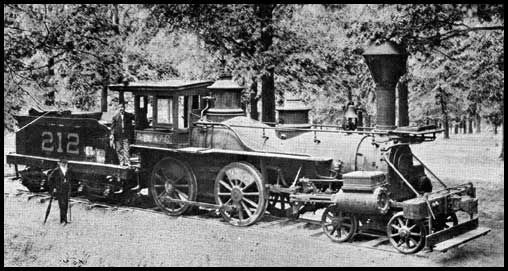 The locomotive the "Yonah" had been leased to a Copper Iron Works and Foundry operating at Etowah. The engine was on a siding with an obvious full head of stream built up and some of Andrew's raiders suggested stopping and destroying the locomotive. However, James J, Andrews decided against that course of action and when William A, Fuller arrived. He commandeered the locomotive and the chase was on in earnest. Above a 1856 4-4-0 locomotive such as the "Yonah". Now on the "Yonah" Fuller and company chased "The General" into the city of Kingston. A run of about 11 miles. There they switched to the locomotive the "William R. Smith". Fuller's group had traveled and additional 31 miles when approximately 2 miles south of the town of Adairville the tracks had been destroyed. Fuller and company ran on foot the next two miles. It was in Adairville that the famous "Texas" finally joined the chase. James J. Andrews had been able to convince the crew of the locomotive to place it on a siding to permit the "General" to go by. He told them his was a supply train with ammunition for General Beauregard at Chattanooga, Tennessee. When William Fuller arrived and discovered that Andrews had just past by. He commandeered the "Texas". However, the train was going south. The locomotive and its Tender were detached from the cars they were pulling. Then the chase of "Andrews Raiders" was continued with the "Texas" and its Tender running backwards. There were some interesting factors working against James J, Andrews. The first was the mistake of taking a regularly scheduled locomotive, "The General", instead of one not in use. This meant the raiders needed to keep to the train's regular schedule to avoid being noticed. Some Station Masters placed Andrews' train on a siding to wait for any south bound trains to pass, on their own schedules, as there was only one track. His second mistake I have previously mentioned. Additionally as James J, Andrews encountered small railroad stations along his route. He had to stop and explain that his was a special train heading to Chattanooga with needed munitions for General Beauregard to avoid further suspicion. As their were no passenger cars as normally on the "General's" run. The station masters had no choice to question the story, because all the telegraph lines south of each had been cut. Then, an unforeseen south bound train problem occurred. General Beauregard was evacuating civilians from Chattanooga and this meant extra trains that Andrews and his men had to go off on a siding for. All of these factors took precious time from the "General's" movement North and closed the gap for William A. Fuller and Anthony Murphy. Above General Beauregard commander of the town of Chattanooga, Tennessee. Andrews and his raiders passed through Calhoun, Georgia without stopping and continue to cut the telegraph lines, but his plans of burning bridges was stopped not by Fuller's pursuit but rain. When going into Marietta it had been raining heavily. Apparently all the wood on the bridges the raiders encountered were soaked so badly from the previous days rain that they would not ignite. William Fuller on the other hand did stop. in Calhoun, for a few short minutes to pick up Ed Henderson the telegraph operator from Dalton. When they reached Dalton Henderson droped off the "Texas". He will be able to notify authorities about what has been occurring, because by that time the raiders have stopped cutting the lines behind them. Prior to Fuller's arrival in Dalton. James J. Andrews had stopped in Reseca, Georgia and dropped off one of the box cars to add speed to the "General". Earlier he had attempted to stop William Fuller with another box car. The raiders had also previously passed through both the small towns of Tilton and Dalton without stopping. These were scheduled stops, but at this point Andrews was thinking more of getting to the Union lines around Chattanooga then being noticed. What he didn't know was that Brigadier General Mitchel had not moved to lay siege to the city as originally planned, because of unexpected very strong resistance by General Beauregard's troops. Next James Andrews arrived at the town of Tunnel Hill, Georgia. The town gets its name from a 1,497 foot tunnel through Chetoogeta Mountain. Andrews had planned to damage the tunnel, but that was also ruined by the rain. However, the remaining box car was dry. He gave orders to set it on fire and left it in the tunnel. What Fuller's pursuit had accomplished was to eliminate any chance of "Andrews Raiders" obtaining fire wood for the "General". Just north of the town of Ringgold, Georgia they run out of fuel for the locomotive and have to abandoned it. They were only 18 miles south of Chattanooga and Andrews and his men are now on foot. For all intensive purposes the raid has been a complete failure as was Brigadier General Mitchel's plans to take the city. "The Great Locomotive Chase" covered a total distance of 87 miles and took approximately 8 hours from start to finish. Private Wilson W. Brown, 21st Ohio, later promoted to 2nd Lieutenant, awarded the Medal on Honor on September 17, 1863. Corporal Daniel Allen Dorsey, 33rd Ohio, later promoted to 1st Lieutenant, awarded the Medal of Honor on September 17, 1863. Private William James Knight, 21st Ohio, awarded the Medal of Honor on September 17, 1863. Private John Alfred Wilson, 21st Ohio, awarded the Medal of Honor on September 17, 1863. Private John Wollam, 33rd Ohio, awarded the Medal of Honor on July 20, 1864. Private Mark Wood, 21st Ohio, later promoted to 2nd Lieutenant, awarded the Medal of Honor on September 17, 1863. Private William Bensinger, 21st Ohio, later promoted to Captain, awarded the Medal of Honor on March 25, 1863. Private Robert Buffum, 21st Ohio, later promoted to 2nd Lieutenant, awarded the Medal of Honor on March 25, 1863. Sergeant Elihu H, Mason, 21st Ohio, later promoted to Captain, awarded the Medal of Honor on March 25, 1863. Private Jacob Parrott, 33rd Ohio, later promoted to 1st Lieutenant, awarded the Medal of Honor on March 25, 1863. Jacob Parrott was the first person to ever receive the Congressional Medal of Honor. William Pittenger, Company, 2nd Ohio, later promoted to Sergeant, awarded the Medal of Honor on March 25, 1863. Author of the 1863 book "The Great Locomotive Chase". Corporal William H. H. Reddick, 33rd Ohio, later promoted to 2nd Lieutenant, awarded the Medal of Honor on March 25, 1863. William Hunter Campbell, Civilian, not illegible for Medal of Honor. Private Samuel Robertson, 33rd Ohio, received the Medal of Honor posthumously on September 17, 1863. Sergeant Major Marion A. Ross, 2nd Ohio, received the Medal of Honor posthumously on September 17, 1863. Sergeant John Morehead Scott, 21st Ohio, received the Medal of Honor posthumously on August 4, 1866. Private Charles Perry Shadrack, real name was Phillip Gephart Shadrack, 2nd Ohio, the Medal of Honor was not authorized until January 28, 2008 by Public Law H.R. 4986, Sec. 564, but never issued. Private Samuel Slavens, 33rd Ohio, received the Medal of Honor posthumously on July 28, 1863. Private George Davenport Wilson, 2nd Ohio, the Medal of Honor was not authorized until January 28, 2008 by Public Law H.R. 4986, Sec. 565, but never issued. Andrews was identified as the leader of the raid after his capture. He was tried in Chattanooga, Tennessee and sentenced to be hanged one week after his court-martial. He was returned to a cell to await his hanging date, but on June 1, 1862 escaped. Only to be recaptured the following day and transferred to Atlanta, Georgia. The execution of James J. Andrews as a "Union Spy" was carried out on June 7, 1862, but it didn't go as planned. Whomever built the scaffold got the height wrong. When the trap door was sprung his feet touched the ground and Andrews died slowly of strangulation. Upon hearing of his death. Elizabeth Layton went into depression and died two years later. Her family saying the cause was a broken heart. 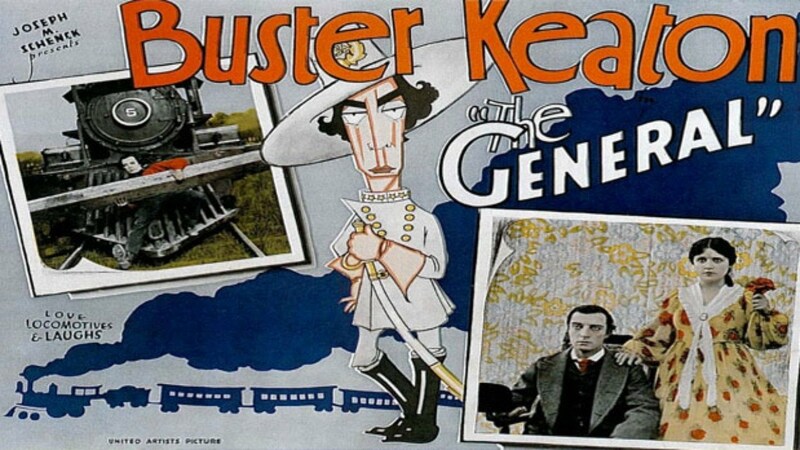 Very loosely based upon William Pittenger's book was Buster Keaton's 1926 silent motion picture "The General". Other than the two main locomotive's names and the fact that Union Spy's steal the "General". There is not one situation, or name that is real. William Pittenger wrote his book from the Union point of view and Buster Keaton thought the audience would not accept the Confederates as villains. A telling point for the time the picture was released. So he changed the perspective of his story. Buster Keaton tells of a young man named "Johnnie Gray" which he portrays. He has two great loves in his young life. There is the girl Gray wants to marry "Annabelle Lee" played by Mack Sennett star Marion Mack, actually Joey Marion McCreery, and the locomotive "The General". The Civil War breaks out and "Johnnie" is unable to join the Confederate Army, because he is more valuable as the Engineer of "The General". This leads to a misunderstanding with "Annabelle" and her family. They believe he is a coward and is deliberately not enlisting. For some reason "Johnnie" does not explain the why to them. "Annabelle" only wants to marry a man in a Uniform and refuses to talk to "Johnnie". A year later "Annabelle" finds out that her father was wounded in the War. She travels on a train with the locomotive "The General" pulling the cars. The only true event takes place next. As a group of Union Spy's lead by a "Captain Anderson" takes the train at a stop for breakfast. The girl becomes a prisoner and "Johnnie" goes after it. He first chases the train on foot and then find and uses a Handcar. Buster Keaton's "Johnnie Gray" arrives at Chattanooga, Tennessee and informs a General of what has happened. Confederate troops are loaded on flat cars behind the locomotive "The Texas". What he does not know is the flat cars are not hooked up to the locomotive and he leaves without the troops. As "Johnnie" moves toward "The General" and "Captain Anderson" and his raiders. They attempt to stop him by throwing railroad ties on the track and other means. Our hero arrives at the Union camp and hides the "Texas" in some trees and sneaks in. He finds "Annabelle", rescues her and the two take the "General" back to the Confederate lines. "Johnnie" gets the Confederate troops to attack those of the Union. He is presented with "Captain Anderson's" sword, made a Lieutenant in the Confederate army and wins his girl. Obviously this is not the actual story. The motion picture was panned by critics at the time and was a financial failure at the box office. Today this film is considered a cinematic "Masterpiece". At one point it was praised by Orson Wells. The actual locomotive the "General" was on display in Atlanta, Georgia and the producers attempted to borrow it. They were able to get two other Civil War era locomotives to use in the picture. In one great scene they actually destroy one of them at the film's climax. As I just said this was an actual locomotive and it stayed where it fell. The locomotive became a local tourist attraction until it was taken for scarp metal during World War 2. 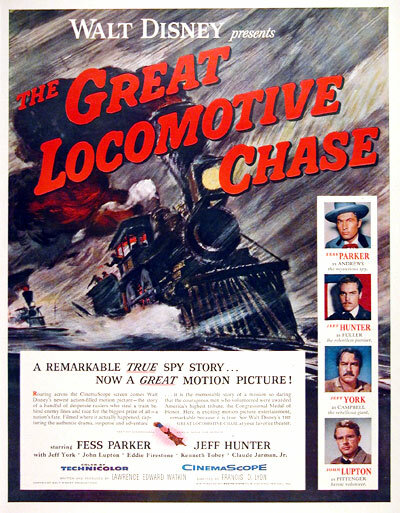 "Walt Disney's 'The Great Locomotive Chase"
The film uses many actual names, but it plays with history. Portraying "James J. Andrews" was clean shaven Fess Parker. 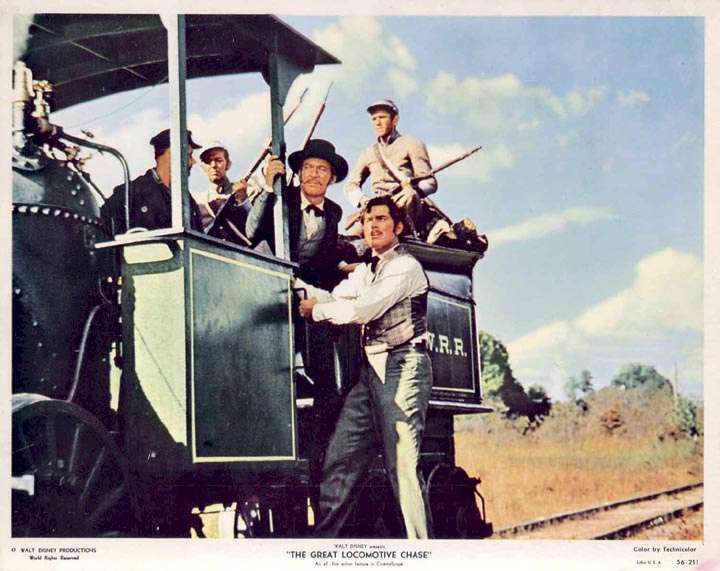 "The Great Locomotive Chase" was released on June 8, 1956. Viewers of Walt Disney's television program "Disneyland" had just seen Fess Parker in "Davy Crockett and the River Pirates" on December 15, 1955 six months before. To all of kids Parker was "Davy Crockett, the King of the Wild Frontier". We had also seen Parker in his "Davy Crockett" outfit on the live ABC broadcast of the opening day of "Disneyland Park" in Anaheim, California July 15, 1955. So when this film opened the audience was primed. Jeffrey Hunter was cast as William Allen Fuller. Two westerns had been released in 1956 starring Hunter. In "The Proud Ones" he co-starred with Robert Ryan and Virginia Mayo. In John Ford's classic "The Searchers" he was "Martin Pawley". Who rides with John Wayne's bigoted "Uncle Ethan" in search of Natalie Wood's "Debbie". Kenneth Tobey portrayed Anthony Murphy. 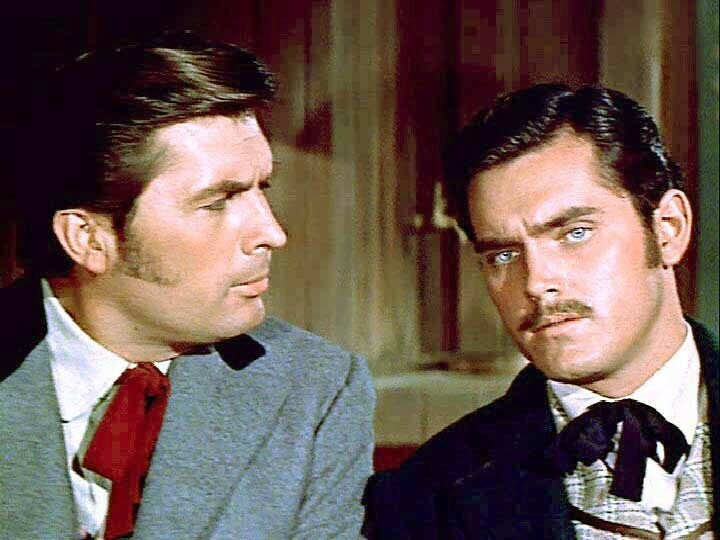 Tobey had worked with Fess Parker as "Jim Bowie" in the Alamo segment of the original "Davy Crockett, King of the Wild Frontier" mini-series. He was "Jocko", "Mike Fink's" right hand man in both segments of "The River Pirates" with Jeff York. At the time Tobey was also known to Science Fiction fans for starring in Howard Hawk's "The Thing from Another World" and two by stop motion animator Ray Harryhausen "The Beast from 20,000 Fathoms" and "It Came from Beneath the Sea". 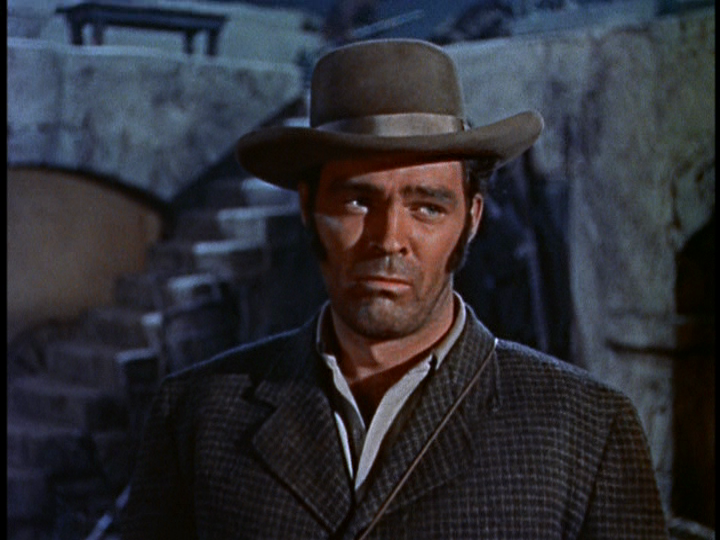 Below KennethTobey, center, with Jeffrey Hunter. As to the Union raiders they were cut down from 24 to 11 including Andrews. The actual William Hunter Campbell was changed from a civilian to a Union soldier in the Disney picture. The role was portrayed by Jeff York. York had just been seen as "Mike Fink, King of the River" in the two episode mini-series "Davy Crockett and the River Pirates". I could not locate a still of York in this film, but the picture below is of him in "Westward Ho The Wagons". Another Walt Disney picture with Fess Parker released in December of 1956. Don Megowan was cast as Marion R. Ross. Megowan had portrayed William Travis in the "Alamo" segment of Disney's "Davy Crockett" in 1955. 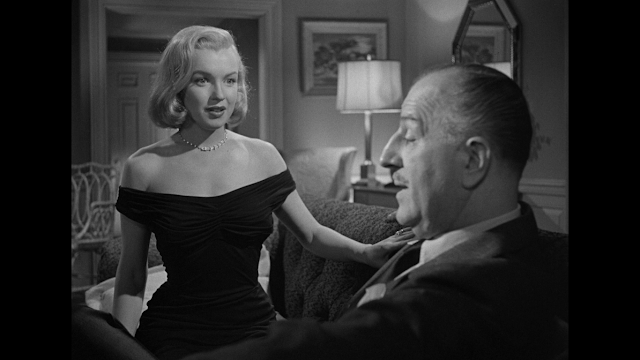 In 1956 besides this role in "The Great Locomotive Chase". The actor was seen as the changed version of "The Creature from the Black Lagoon" in the final entry of the trilogy "The Creature Walks Among Us". Also in 1956 he appeared as the Sheriff in the forgotten and overlooked excellent horror picture "The Werewolf". Below the actor as Travis. John Lupton was cast as William Pittenger. His character narrates the story as if he's reading from the book Pittenger had written. 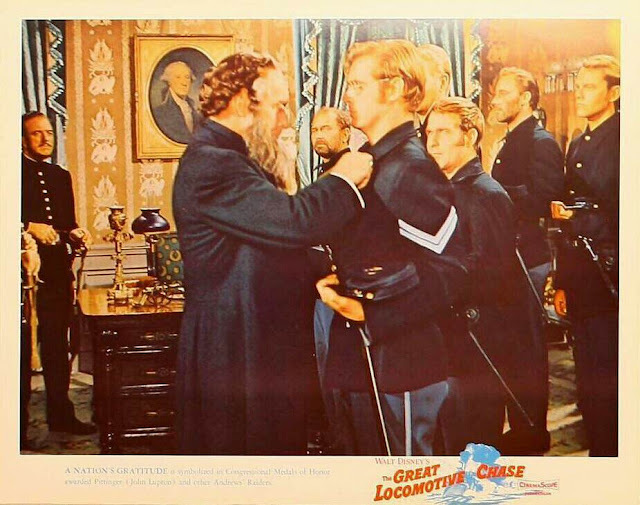 The opening sequence is set on March 25, 1863 when the first Congressional Medals of Honor are to be given out. The screenplay then becomes a flashback. John Lupton would immediately follow the film's release, on September 25, 1956, portraying "Tom Jeffords" with Michael Ansara as "Cochise" in the 72 episode television series "Broken Arrow". The TV show was based upon the 1950 motion picture starring James Stewart and Jeff Chandler in those roles. Lupton is seen as Pittenger on the right in the following still. Claude Jarman Jr. portrayed the first Medal of Honor winner Jacob Parrott. Prior to this film at the age of 12 Claude had been known for the 1946 movie "The Yearling". It was based upon a popular novel about a boy adopting a young deer. The film starred Gregory Peck and Jane Wyman. Jarman, Jr. had also portrayed the son of John Wayne and Maureen O'Hara in John Ford's classic "Rio Grande". Jarman is seen on the far right of the following still. Don Megowan as "Ross" is directly to Fess Parker's right and John Lupton can be seen as "Pittenger" wearing glasses. 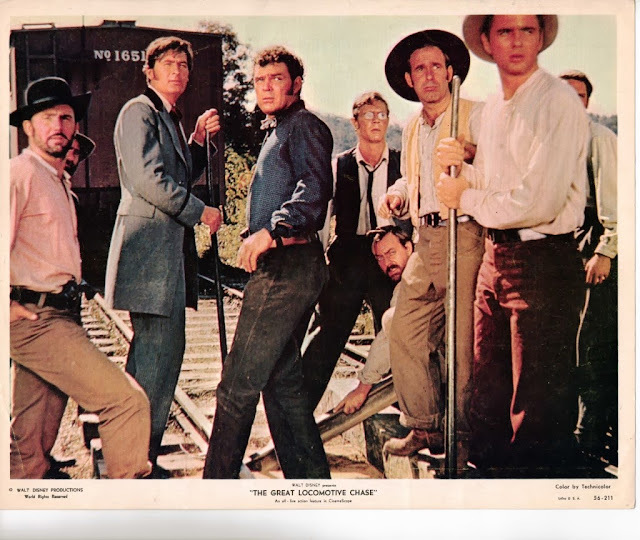 In the above still is actor Eddie Firestone, immediately to Claude Jarman, Jr's left, as Robert Buffum. Below the real Robert Buffum. As far as I could determine in the above still. Actor Leonard P. Geer, is to the immediate left of Fess Parker, as James A. Wilson. As I said the story cut down the number of the actual raiders and in the case of "Wilson". The screen play writers seemed to have created a new name. There were two men with that last name, but neither was named "James A.". 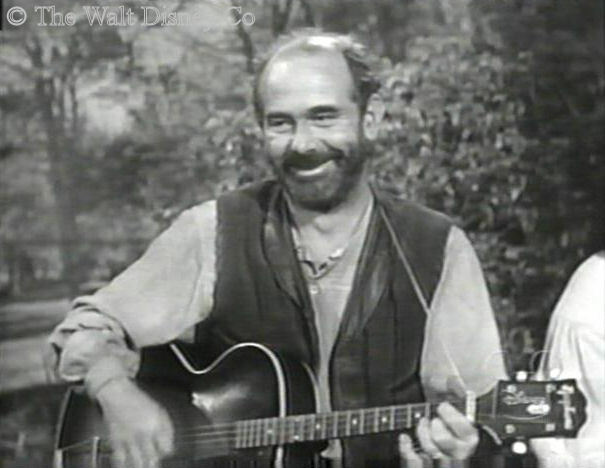 Actor and song writer Stan Jones portrayed Wilson W. Brown. The following is a picture of Jones on an episode of Walt Disney's television program "Disneyland". Jones was known for writing music for John Ford. Initially to demonstrate to the director how fast he could write music. Jones wrote one while the director was at lunch and by the time Ford had returned. Stan Jones had come up with a little ditty he called the "Ghost Riders in the Sky". Below the real Wilson W. Brown. I could not locate photos of the last three actors to portray one of "Andrews Raiders". Stunt man/actor George Robotham portrayed William James Knight. Marc Hamilton portrayed John Wollam. Although I could not find a photo of the actor. I know he had small roles in two science fiction movies from Universal Studio's. They were 1955's "This Island Earth" and 1956's"The Mole People" playing a Priest. He also had a small role in George Stevens' classic "Giant". Also from 1956 starring Elizabeth Taylor, Rock Hudson and James Dean in his last motion picture. Actor John Wiley portrayed John Morehead Scott. Disney's "The Great Locomotive Chase" featured character actor Slim Pickens as the engineer of the "Texas" Pete Bracken. 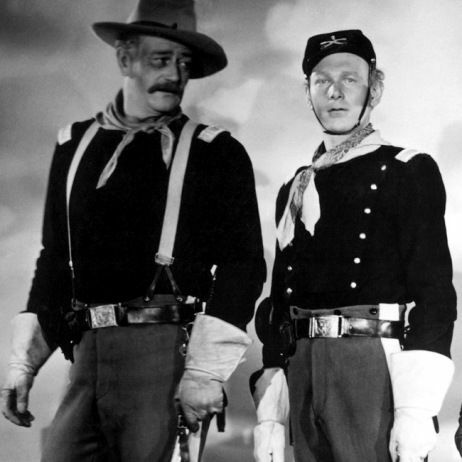 Pickens was known to fans of Westerns since 1946. Before this picture he appeared in many films with "B" Cowboy star Rex Allen as his sidekick either named "Slim" or "Slim Pickens". Afterwards besides television he would appear in two classic motion pictures. Mel Brooks' comedy "Blazing Saddles" and Stanley Kubrick's "Dr Strangelove, or How I Learned to Love the Bomb". Who can forget Maj. "King" Kong riding an atomic bomb down onto Russia? One thing becomes clear is that no actor is the film resembles their real counterparts. Especially when it comes to facial hair. The locomotives used in the picture. Portraying the "Texas" was the "Inyo" built in 1875. Portraying the "Yonah" was the Lafayette" built in 1927. It should be noted that the real "Yonah" was a 4-4-0 design. While the locomotive in the motion picture was a 4-2-0 design. So it is slightly off in looks. The basic plot of the film follows the actual events. What may, or may not have happened are two meetings between James J, Andrews and William A. Fuller. Who is not mentioned as being a Captain in the Confederate Army. The first is on the train being pulled by the "General" leaving Marietta, Georgia. Andrews is known to Fuller as an agent of the Confederate Army. So he approaches him about a group of strange acting men who have boarded the train there. James Andrews shows him a letter signed by General Beauregard that the men are part of a group he is leading as agents of the Confederacy. He swears Fuller to secrecy over this information. Their second meeting happens at the films conclusion after James J. Andrews had been captured. He is in jail awaiting execution and asks to see William Fuller. Andrews mentions they both fought the war in their own way and could they shake hands as both sides will do at the end of the Civil War. Fuller agrees and both men shake their hands. There is no information if this actually occurred, but it makes a very good ending to the motion picture, if that was where the story did end. Walt Disney was surprised by the reception the picture received from both critics and audiences. He had remained as close as possible to both William Pettinger's work and the actual facts. Most everyone agreed that once "Andrews Raiders" is seen leaving the "General" in the tunnel and running from their pursers. The film seemed over as the excitement had ended and so to them had the movie. Disney wanted to complete the story as history recorded it. So we next see the raiders in a Confederate prison and their attempted escape. This is followed by the slow moving sequence between Andrews and Fuller mentioned above, Add this point the audience becomes aware of the executions to follow and that Andrews, who they have been routing for, is to be hanged. This information in a family movie was, to put it mildly, a downer. Although at the end of "Davy Crockett at the Alamo" it is obvious that he is to die by Santa Ana's troops. They way it is presented, showing "Davy" swinging his rifle "Ole Betsy", is up beat and fits the legend created by Walt Disney and history. While the ending for "The Great Locomotive Chase" was too truthful in comparison. Although it would have been worse had they shown the actual hanging of Andrews as it really happened. Then when the film returns to the above picture of honoring the survivors of the raid. We now have what some describe as a triple ending to the film. The awarding of these first Medals of Honor with Pettinger's narrative dialogue. Seems to make the occasion more a wake then the historic moment it was meant to depict. As I said this was in reality a minimal event in the scheme of history and the Civil War, but it has a life of its own that overshadows the facts.